Education Qualification: Ph.D, Master’s Degree and More. 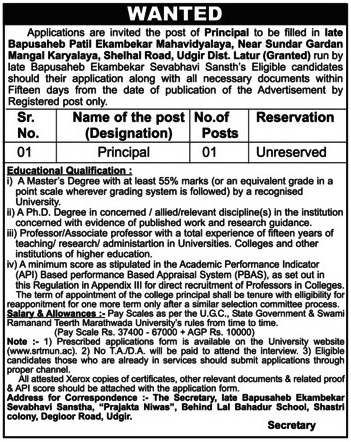 For Post wise Education Details follow the detailed advertisement. Interested & Eligible candidates can send their application along with all the necessary documents and testimonials to The Secretary, Late Bapusaheb Patil Ekambekar Sevabhavi Sanstha, “Prajakta Niwas”, Behind Lal Bahadur School, Shastri colony, Degloor Road, Udgir. Starting Date, Last Date to Apply Offline at Late Bapusaheb Patil Ekambekar Mahavidyalaya which candidates should be remembers as follows. Last Date to Apply Offline: 19-07-2018.